Simon Sherlock's Weblog: Just how quickly does Bokashi break down? Just how quickly does Bokashi break down? 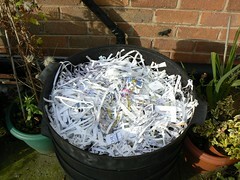 Over on the Wiggly Wigglers Facebook group there is a discussion on Bokashi (Bokashi Qs) and a few of us taking part in an experiment to see how quickly finished Bokashi breaks down under certain conditions, whether on a normal compost heap, in a compost bin, in a wormery, dug into the soil or just left out. I'm adding a finished bin into a wormery and will be keeping a close eye on how long this layer takes to be broken down into useful vermicompost. So it's 19 October 2008 and I started off with a Bokashi bin that has been fermenting in my green house for the last 2 weeks. 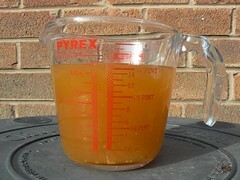 Firstly, I emptied the juice into a measuring container and got just over 3/4 pint which was added to a watering can and used for watering the winter pansies that are being brought on in the greenhouse, ready for planting out in a few weeks (once the summer flowers are done, dug up and composted). 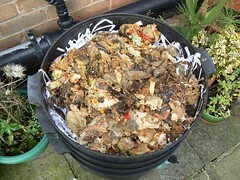 As you can see from the picture below I had added a load of shredded paper to the wormery yesterday partly as a base and partly to increase the amount of carbon in the bin. 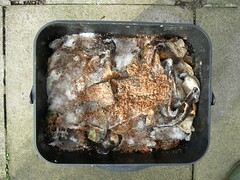 It also helps absorb excess moisture (always a problem in the UK with its incessant rain). 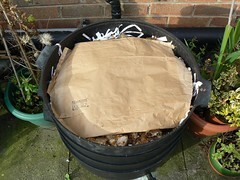 I then added a quarter of the finished bin before placing a large brown envelope over the top to keep things dark. I'll be checking this weekly to see how quickly it breaks down. One thing we have to remember though is things are getting cooler and the worms will slow down somewhat. It will be interesting (well I guess that may depend on your understanding of the word "interesting") to see how the same experiment works out in the Spring/Summer.